Customers of the App Store have set new spending records over the holidays, Apple has confirmed, with late-in-the-year purchases helping to cap off an already record-breaking year, as well as starting 2019 with a new single-day record. Between Christmas Eve and New Year's Eve, App Store spending topped $1.22 billion, Apple advised on Wednesday. The high sales for the period were not the only ones noted by the firm, as consumer spending on apps and games on New Year's Day 2019 alone was over $322 million globally. "The App Store had a record-breaking holiday week and New Year's Day," proclaimed Apple senior vice president of Worldwide Marketing Phil Schiller. 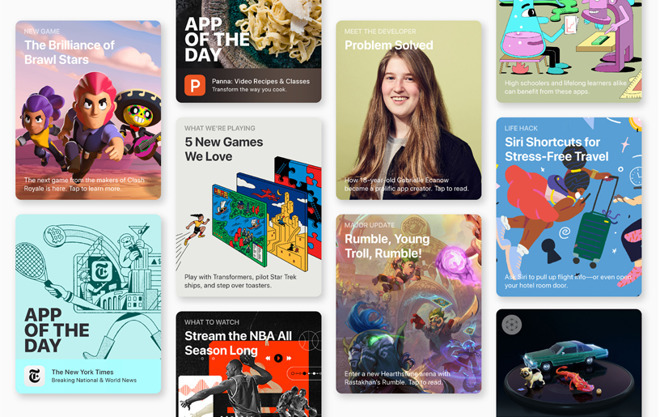 "Thanks to the inspiring work of our talented developers and the support of our incredible customers around the world, the App Store finished off an outstanding 2018 and kicked off 2019 with a bang." The high App Store sales helped drive Services revenue to an all-time record for the quarter, as advised during the company's recent financial guidance alert. App Store sales revenue is not the only record setter for Services, with new benchmarks said to be set for Apple Music, Cloud Services, Apple Pay, and the App Store's search ad business. The most popular categories of app downloads and subscriptions during the holiday period were gaming and self care, with Fortnite and Player Unknown's Battlegrounds among the top downloaded games, as well as Brawl Stars, Asphalt 9, and Monster Strike. Productivity, Health & Fitness, and Education apps also did well for the start of the year as users attempt to turn an new leaf in their personal lives, with 1Password, Sweat, and Luminosity being among the most popular apps of each respective category.